With time ticking you want to be as close to the middle of the city – handily called Mitte, or Middle. 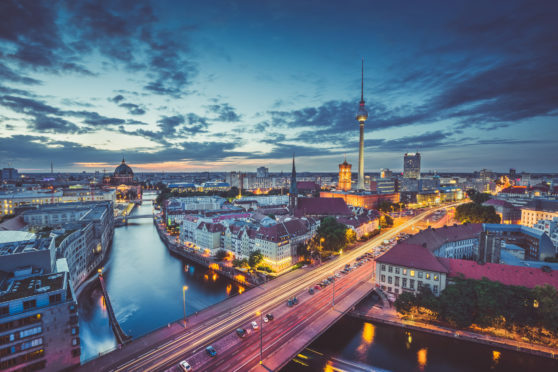 The main touristy areas, such as Alexanderplatz and Potsdamer Platz, are on your doorstep if you pick a hotel anywhere around here. If you want to steep yourself in the local culture then you’ll find bratwurst and schnitzel to your heart’s content. Konigsberger klopse are a meatball speciality and maultaschen is a stuffed pasta that comes either boiled or fried. But if you only have tummy room for one dish then you’ll find currywurst, a grilled sausage with a distinctive sauce, everywhere. Cheap, filling and tasty. Berliners love it so much there’s even a museum in its honour. A bar atop a multi-storey car park may not sound appealing but on a nice day or evening Klunkerkranich is THE rooftop bar for sights and sipping. Prater Garten is the city’s oldest beer garden and it’s still a great place for a decent value pint although, unsurprisingly, it gets really busy when the weather’s good. Green Door is a top spot for cocktail lovers, a classy bar that’s been a haunt of big stars including former Berlin resident David Bowie. Head for Museum Island. There are five museums in the complex, which is a UNESCO World Heritage site, the oldest dating back to 1830. Get one-ticket entry to all. You obviously can’t travel to Berlin without referencing the Wall. Very little remains but at the Berlin Wall Memorial you can learn about its short but history-filled past. Checkpoint Charlie – the name given to the best-known Berlin Wall crossing point between East Berlin and West Berlin during the Cold War – is another name from the past to check off your list. It’s worth booking in advance for a tour of the famous domed Reichstag – old outside, marvellously modern inside after the 1990s reconstruction. It’s just minutes from the iconic 18th Century Brandenburg Gate. As you walk through it you can’t help but think of the major historical moments it has witnessed.